Exhibition: ⌘ / Place of Interest, 2010. Photo by KEH-J. The Reading Corner was moved to its permanent location in the upper gallery space for visitors to browse through the growing book arts collection. The tradition of the Book Café – designed to the occasion by puppet maker and set designer Lena Hansen – was restored with a new look. The guest of honour D.Phil. Else Marie Bukdahl, former president of The Royal Danish Academy of Fine Arts, Copenhagen opened the Festival on Friday the 14th of May. (Her opening speech can be read in Danish here. Else Marie Bukdahl during the opening speech, 2010 by KEH-J. The chairman of the board of the Limfjordscentret Niels Peter Riis and Centre Director Karin Nikolaus also spoke a few words. The music trio: Morgentau from Kassel, Germany accompanied the whole opening ceremony. To put the final mark on the occasion a unique cake had been made for all to enjoy. Edible artist's book cake by Camilla Hempel-Jørgensen. Photo KEH-J 2010. On Saturday May 15th a list of talks had been arranged, three of which were by the research staff from the Centre for Fine Print Research (CFPR) at the University of West England, Bristol. This talk/workshop took place on the 3rd floor of the Tower of the Limfjordscentret and participants were encouraged to bring their own camera. Paul then went through the process of how to produce and stitch panoramic photographs of the landscape for digital print and books. To learn more about the event and to see notes and tips go to this link. Paul Laidler is Research Associate at CFPR, specializing in Digital Print and Digital Photography. The talk discussed how artists are using the laser cutter as a creative tool, with examples of artists’ works on paper and artists’ books. Download Tom Sowden’s slideshow and handout. Tom is Research Fellow and Academic Lead for the CFPR’s laser cutting area. This was a themed talk of collections and observations of nature, talking about: textscapes, journeys through landscape, working in the landscape, the politics of landscape, altered books and nature, and a darker (then lighter) side of nature. Download Sarah’s slideshow and handout. Sarah is Senior Research Fellow for Artists' Books at CFPR, where she runs projects investigating and promoting contemporary book arts. Sarah Bodman during her talk. Photo KEH-J, 2010. In the afternoon French/Dutch artist Anne Bossenbroek-Bouchard gave a talk about her bookworks, Mail Art and Artist trading cards. Anne Bossenbroek-Bouchard giving her talk. Photo KEH-J, 2010. Over the course of the 3 days a range of workshops took placed organized by the artists themselves in the Creative Workshop at the Limfjordscentret. Here a list of the workshops with some images. Mette-Sofie D. Ambeck – Bookmark with pop-up initials, beginner’s pop-up. Mette-Sofie D. Ambeck, pop-up workshop. Photo KEH-J, 2010. Martin Degn Pedersen – Paper marbling. Martin Degn Pedersen (right) teaching his workshop. Photo KEH-J, 2010. Gert Hansen (end of table) teaching Origami. KEH-J, 2010. Lisa Kahn – Mood books. Lisa Kahn (end of table) making Mood books. Photo KEH-J, 2010. Anne Bossenbroek-Bouchard – Mail Art and Artist trading cards (ATCs). Anne Bossenbroek-Bouchard (left) teaching her workshop. Photo KEH-J, 2010. Anita Pedersen – Making butterflies, a workshop for children. Anita Pedersen (right) teaching Butterfly making at her stand, 2010. Photo M-SDA. In the Reading Corner – Angie Butler demonstrated and talked about her new permanent space at the Limfjordscentret: Pet Galerie – The Book Jacket. A gallery/installation in the form of a coat peg rack with a traditional English tweed jacket and a cap hiding stories and treasures to be discovered. To see pictures at Pet Galerie go to archive 2010 and The Book Jacket. Angie telling about The Book Jacket worn by Ahlrich van Ohlen stood behind her. Photo KEH-J, 2010. 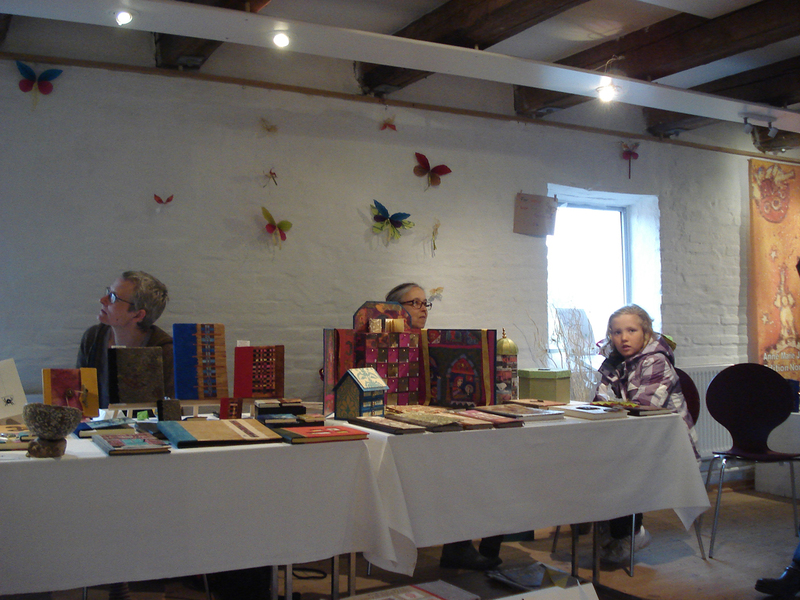 Anne-Dorthe Grigaff told folk tales to children in the Historical exhibition by the lady spinning wool yarns. Anne-Dorthe Grigaff telling folk tales. Photo KEH-J, 2010. A group from the Bookbinding evening class at Holstebro Activity Center had set up their own workshop area for the second year running and were mending old worn books using traditional equipment and demonstrating techniques of the old craft. In the evening of the Saturday May 15th "tradition" had it that all participants got together for a social evening with buffet and music by Morgentau. Everyone helped themselves at the buffet. Photo KEH-J, 2010. As in 2009 Sarah Bodman and Tom Sowden made a collaborative artist’s book to the annual theme: A Place of Interest. The piece was created en route during the drive and ferry crossing between Bristol, UK and Doverodde, DK using a typewriter, Polaroid camera and GPS. A Place of Interest by Sarah Bodman & Tom Sowden. Photo KEH-J, 2010. A collaborative video of the journey and making of the book was also produced with the help of fellow travellers on the trip: Angie Butler, Paul Laidler, Natalie McGrorty, Simon Smith, Sarah Bodman and Tom Sowden. Watch the video here. You can download a pdf of the book to print and assemble yourself. Step 2: Set your print/page set up to A4 landscape. Step 4: Score down the middle of each page with a bonefolder. Step 5: To assemble the pile of pages, start with the page 1 and 2 place with the cover face down, then place page 3-4 so Sarah and Tom's signatures are facing up, then page 5-6 so the image of the disused building is facing up, 7-8 so the little summer cabin is face up, 9-10 so the image of the ship's deck is face up. Step 6: Staple in the middle and fold all the pages over so the title is on the front page. 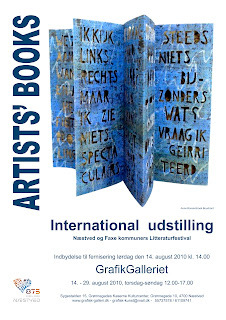 After the Festival weekend the Limfjordscentret hosted a special exhibition of copperplate prints by Iraqi/Danish artist Hussein Tai from May 18-JuneX, 2010. He had also taken part in the whole Festival exhibiting a piece in the themed exhibition and holding a stand. The Marsh by Hussein Tai, 2010. Photo KEH-J. 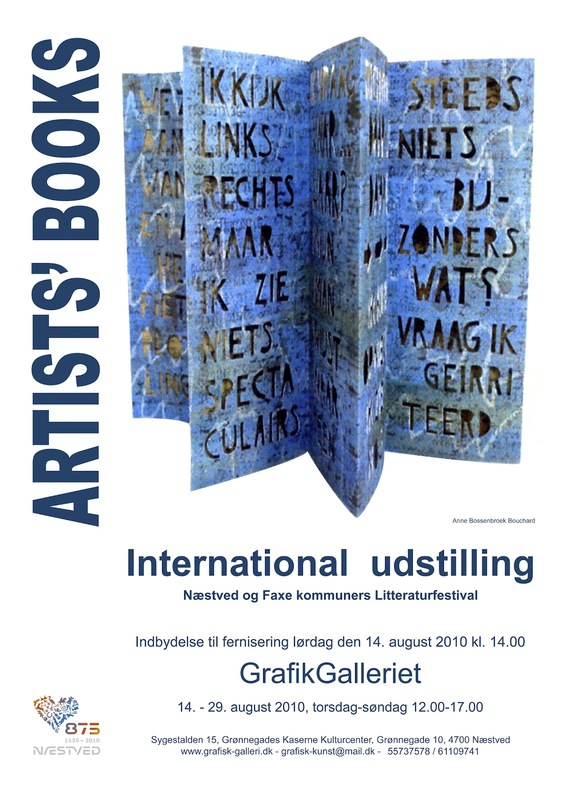 In August of 2010 the international themed exhibition: ⌘ / Place of Interest was taken on tour to Sjælland (Zealand), Denmark to be exhibited at the Grafisk Værksted (Print Studio for Artists) as part of two municipalities: Næstved and Faxe Literature Festival. Jan Kiowsky organized the exhibition. The exhibition flyer, 2010. Artist's book by Anne Bossenbroek-Bouchard.